After completing the first part of the campaign and getting the reward Stug IV some years ago i sold the tank. Now trying to reacquire what is rightfully mine after so much effort i am unable to reposes . One of my clan mates having the same issue and having sold both Stug IV and T28 concept in the past has acquired both tanks just by going to the campaign section - campaign rewards and simply clicking the buy button below both tanks. After contacting player support i was given the same treatment that everybody gets , typical msg and no solution. Finally one guy suggested to me to post my problem here..
WHY should i even go in the trouble to do so ? Obviously its an unfair bug of the game and should have been relayed to the proper team by the player support team , isnt that why they are there in the first place? Why should it be so frustrating for me to get back something i put so much effort in getting in the first place while my clan mate can get with a simple click ? Edited by Jagertron, 29 August 2018 - 11:09 AM. The restore feature only works for tanks sold after 9.16 (if it wouldn't be bugged right now anyway) when it was introduced. If you sold the tank before that patch you're probably out of luck, unless you can find a generous support staff member. be nice and courteous and ask nicely explaining the situation. Edited by cragarion, 29 August 2018 - 11:24 AM. Since when is something you sold, still rightfully yours? True. But he should be able to buy it back for double the price he got selling it. Same rules as for the tech tree tanks should apply. Edited by Kurat666, 29 August 2018 - 11:30 AM. I have tried twice with CS to get my StuG IV back, since it was sold before the change. We'll see how many requests one has to do before they realize that they would save themselves some time by just pressing a few buttons. The answer i got from the ticket is that i was right about and to open a thread here for the developers to see and fix, my question is why should i go through this process since they understand the bug !!! Edited by Jagertron, 29 August 2018 - 05:02 PM. It was yours by right indeed. But you gave up that right when you sold it and waited too long to recover it. You should have read the rules for tank recovery before you sold it. Fair or not. It is how they made it. As far as i know, PM reward tanks cannot be recovered, and most likely you got a warning message telling you this when you sold it. I've traded in one of the reward tanks and the message was there, warning me before finalizing the action. If you're sure you didn't get the warning, then contact support, but i would say it's a waste of their time, as well as yours. One of my clan mates re bought both stug and t28 through this feature .... so ? It was ok for him and not for others? Well it works for me, I can buy it back but I wont because that tank is a piece of garbage that I never play so why let it occupy one garage slot? Life isn't 100% "fair", get used to it. Very helpful comment , in that sense you should not do anything that happens to you in your life and you think is unfair ! You sold it so it's nobodies fault but your own. Back when you sold it (before 9.6) there was no buy back program in place so you would have known you were selling it forever. All you do here is whining. What do you expect from that? Incite a riot to support your cause? But its fair to restore it for others that sold it after 9.6..... right ? Thanks for getting back to us and letting us know about your opinion. Good day, Jagertron‍! and I hope this message finds you well. We look at every possible inputs from players, gamers and tank commanders to ensure the improvement of the game. For that, we treat suggestions and feedback gold since these information are always considered whenever future developments are being planned out. I am sorry if we are unable to grant your request this time. I highly encourage you to make a feedback via our Forums Suggestions Thread. Please know that our game developers checks this thread for ideas which they can consider including or updating in future updates. 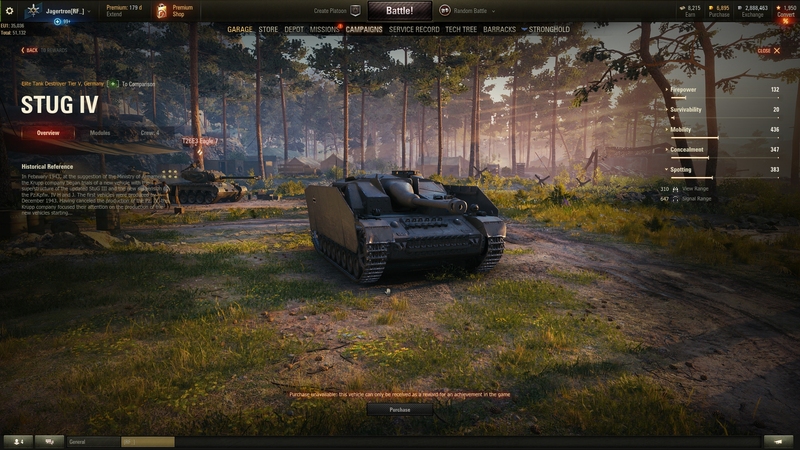 For other questions related to WoT PC, feel free to check out our Player Support Page. You may also find useful information and tactics from our WoT Wiki Page. I wish you the best of luck and much success in the battlefield. Edited by Jagertron, 31 August 2018 - 05:32 PM. They changed the recovery conditions for everybody. Nobody else gets to restore vehicles they sold before 9.6 so why should you get to? You're asking them to change the rules just for you. If you park illegally and get a fine, then 2 months later the council make parking spaces where you were fined for parking do you think the fine will suddenly not apply to you? Of course it will, because they weren't parking spaces when you received your fine. It's the same principle here... You sold your tank back when it could not be recovered. You made that choice. They .... told me to do this ..... you do understand that ..... or not? Edited by Jagertron, 06 September 2018 - 10:25 AM. For what I can read between the lines the "guy" (as if) told you to gtfo and post in the Suggestions thread of the forum (and not create an own thread in Gameplay). My guess is that you don't quite understand the phrases support employees (human or not) are forced to use. He just told you that WG doesn't regard your issue as a bug, but wishful thinking. Edited by Aimless, 06 September 2018 - 10:35 AM. European Community → Deutschsprachige Community → Forum → Anleitungen → Tipps, Hilfe & Fragen zum Gameplay → Wie genau werden die Fahrzeuge der Kampagne einem überreicht?